(Served as HARTLEY), Son of Mrs. Jane Howarth, of 24, Cuerdale St., Harle Syke, Burnley. Mrs. Howarth, widow, of 24, Cuerdale-street, Briercliffe, has received official information that her son, Bombdr. Harry Hartley Howarth was killed in action last week in France. He was attached to the 122nd Brigade, R.F.A., (5675), and was aged 22. Bombdr. Howarth enlisted on August 7th 1914. He had ben out in France for three years, and gone through without a scratch up to the time of his death. He had only two leave terms during his three years in France. He was single, and a good athlete, holding two medals won in France for cross-country running. The first was won in 1916, when he was in the winning team, the 102nd Batery, R.F.A. He was connected with St James's Sunday School and formerly employed by Messrs. ? Thornton and Co., Harle Syke. There are two brothers serving - Pte. Smith Howarth, married, stationed at Carlisle, and Pte. Jam? 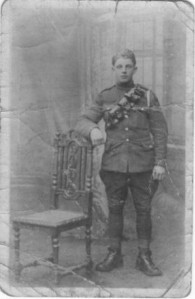 Howarth, aged 18, stationed at armouth and also a brother-in-law serving in India. With thanks to Andrew at Burnley in the Great War for the main image and the memorial ribbon.